systems of automatic design of hardware based on FPGA. An OPS is focused on different target parallel architectures. OPS development group investigates new optimizing transformations and new compilation possibilities. C + ParDo loops marks. Automatic estimation of measure of inaccuracy. Internal representation is oriented on parsers from different languages (C, FORTRAN, Pascal) usability, program transformations development flexibility and multiple architecture code generation possibility. Implemented transformations automatically check conditions of equivalence based on dependence graph or lattice graph. Not all program transformations check semantic correctness of applicability. It can lead to an error of the system and it should be resolved in a future versions. Linear program fragments and expressions transformations. Mixed computation in arithmetic expressions. Substitution forward and constant propagation. The splitting of the vertices (declaration of additional arrays). Stretching scalars (array replacing the scalar variable). Loops with linear recurrence transformations. Replacement of loop with two linear recurrences contain only constant coefficients onto loop without recurrence. Replacement of loop with one affined recurrence contain only constant coefficients onto loop without recurrence. Replacement of loop which calculates the sum of the series with polynomial general term onto a single formula. Non-unimodular perfect loop nests transformations. Loop nests induction variables renaming. Loop into loop nests transformations. 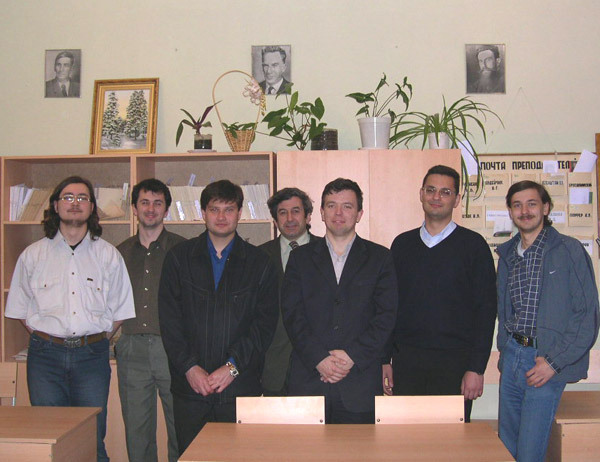 (Top row from left to right) Zinovij Nis, Konstantin Gufan, Alexander Shulzhenko, Roman Morilev, Victor Petrenko, Mihail Shilov, Milena Eremeeva, Maria Tzibulina, Sergej Naumenko, Alexander Butov, Polina Shaternikova.